BBT Translation Services provides translation of documents for immigration (USCIS).Among other documents, we do translation of passports, translation of birth certificate, translation of marriage certificates, translation of document or citizenship, we provide certified translation service and more. "1003.33 Translation of documents. Any foreign language document offered by a party in a proceeding shall be accompanied by an English language translation and a certification signed by the translator that must be printed legibly or typed. Such certification must include a statement that the translator is competent to translate the document, and that the translation is true and accurate to the best of the translator's abilities." Processing the immigration cases can be a long and tedious procedure. Here ,at BBT Translation Services, we offer you "one stop shop"! We can assist you with all your translation needs. We provide translation service for USCIS, and adhere to their standards. 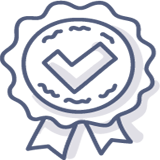 After translation is completed we provide a certificate of translation attesting the accuracy of the translation and the competency of the translator to translate your document. 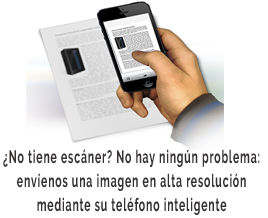 We can translate your document and deliver it in any format. We can deliver a PDF file of your translated document, a word document or a fax. We are located in Florida, USA and our certification can be accepted in all the states in USA. Among other documents we do translation of passports, translation of birth certificate, translation of marriage certificates, translation of document or citizenship, certified translation service, legal translation and more. We guarantee their full acceptance by these agencies. Having extensive experience in dealing with these and other US government agencies we know exactly what type of full and formatted translation is needed. 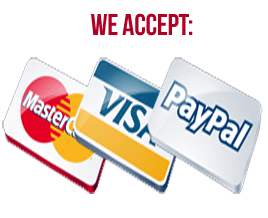 Our Translation for immigration are accepted by the official entities in the USA. Give us a call or send us an e-mail to get a free quote or you can visit our price page to get more information. 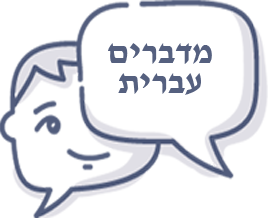 Our translations are performed by professional and experienced translators who have vast knowledge in translating documents for immigration. 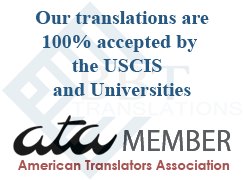 We are members of ATA - American Translators Association and as such we abide by their standards to certify translations for immigration, higher education, employment and any other purpose. .
We are located in the USA and if you need a translation that can stand up to the USA standards for translation you don't have to look any further. What is a certificate of accuracy? A certified translation is a translation of a documents that includes a Certificate of Accuracy signed by the translator attesting to the accuracy of the translation, while mentioning his/her credentials and qualifications to translate your document. The Certificate of Accuracy bears our stamps and our signatures. It is placed in our letterhead. Most of the time it is a mirror image of the original document. Some documents are translated word for word. Yes. Most of our certified translations include a notary signature. The notary signature is from the State of Florida and is accepted in the entire United States, Canada and some European countries. Are you member of any professional organization? Yes. We are members of ATA - American Translators Association, the well recognized translators association in the United States. Guarantee only applies to USCIS, employers and university records evaluation/review boards. 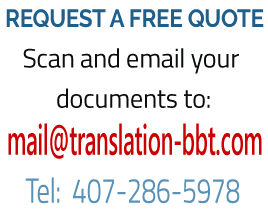 If your translation is for a state, county or city office (especially DMV (Department of Motor Vehicles)), or for an individual college or university please contact them first to ensure that they will accept a translation that is certified and notarized in the State of Florida. We translate all type of documents for immigration (USCIS), employment, education and more.